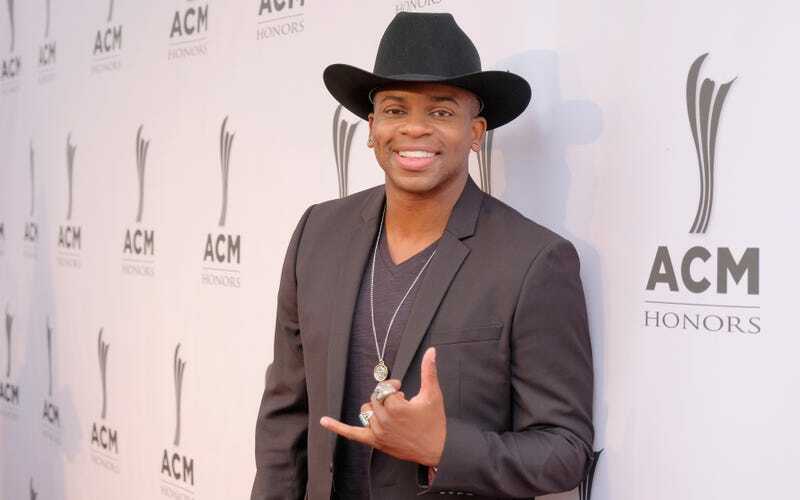 Jimmie Allen attends the 12th Annual ACM Honors on August 22, 2018 in Nashville, Tennessee. “If someone asked me two years ago if I thought that this would be my life today—that I’d be on the red carpet at the CMAs or my song would be the No. 1 song on country radio, I would have honestly said no,” country singer Jimmie Allen said in a press release following the revelation that his debut single, “Best Shot,” premiered in the No. 1 spot, making him the first black artist to launch his country career with a No. 1 single. Brown’s sophomore album, Experiment debuted at no. 1 on the Billboard 200 chart, making it the third country release to earn the spot in 2018. It’s also the first country sophomore album to reach no. 1 on the 200 chart since 2014. It’s also earned the most first-day streams for a country album in the U.S. ever on Apple Music. The 25-year-old singer-songwriter’s 2016 self-titled debut album peaked at no. 5 on the chart. Kane Brown accepts Favorite Male Artist - Country during the 2018 American Music Awards on October 9, 2018 in Los Angeles, California. Despite the genre’s roots in the American blues tradition (as well as folk), successes of this stature have been few and far between for black musicians who favor country music. Prior to Allen’s and Brown’s hits, Darius Rucker, former lead singer of Hootie & the Blowfish, was the only black country artist to hit No. 1 with his 2008 solo debut single, “Don’t Think I Don’t Think About It,” according to Taste of Country. For Rucker, his prior success in the music industry didn’t guarantee instant fame as a country solo act. He initially debuted at No. 51 on the Billboard Hot Country Songs with “Don’t Think I Don’t Think About It” before climbing to the top slot. Rucker would ultimately become the first black artist to win the Country Music Association award for New Artist of the Year in 2009 (the award was introduced in 1981), and only the second to win a CMA after Charley Pride, who won Entertainer of the Year in 1971 and Best Male Vocalist in 1971 and 1972. But as we know, there’s strength in numbers, and with Allen’s new success, there’s yet another strong black presence being represented in country music. Fans who don’t mind a little color in their country can catch both when they team up for Brown’s upcoming Live Forever tour, which launches in January with Allen as an opening act.